Do you like what I did there? A rainbow of leaves? It’s true. If you look hard enough, and use your imagination just a little, you can see the entire ROY G BIV we all once learned about in science class. Of course, they were talking about rainbows there, and these leaves are not rainbows, but hopefully you see the artistic slant in all this. People who see this bush, which has grown in my front yard for the last 20 years, are amazed by what it does in the fall. Eventually, the leaves will all go to a bright yellow, but they don’t drop. They just slowly loose their color, and get really thick for the winter. The cool thing is that they progress through all these different colors first, and almost never in unison, so you wind up with this bizarre looking plant. I can’t account for the flower in this picture, beyond the fact that it has been unseasonably mild this fall, and perhaps this poor guy got his seasons mixed up. 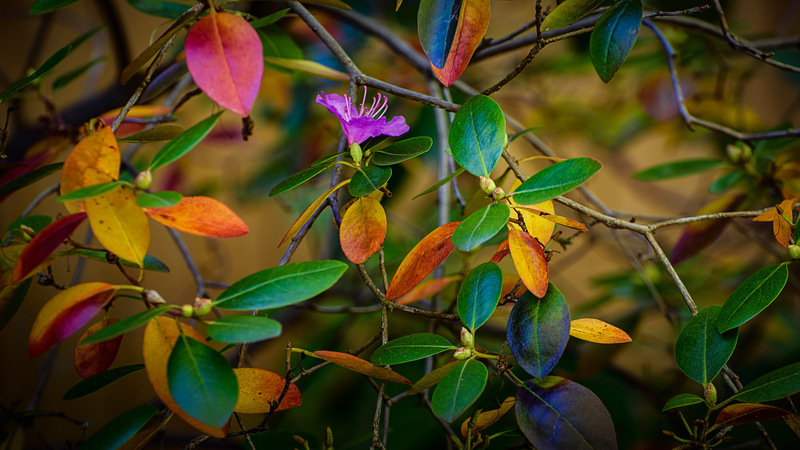 Sometimes people see one of my pictures of this bush and assume I’ve photoshopped the colors. That sort of drives me nuts. I’ll admit to using photoshop, but I don’t manufacture false images unless they are obviously so. I’m more of the subtle enhancement kind of guy, and almost every picture gets a vignette. For this picture, I got most of my bang out of the contrast slider in lightroom, and I did make the jump to photoshop for some sharpening, and curves adjustments in the channels. Back in lightroom, I applied some more sharpening (not sure why) and I’ll admit hitting the vibrance slider a bit, but the base colors are all genuine; I promise. Fall continues to progress here in the northeast, but we continue to enjoy a mild run of days. We have not seen a snow yet that has stuck, and by that I mean accumulate, or at least not melt on contact with the ground. This has the skiers pulling their hair out, but most everyone else is pretty ok with it. There have been some heavy frosts lately, and I’ve been fortunate enough to put a few hours together to get out and grab some shots of the frosty landscape. I look forward to sharing them with you soon. Have a great day!! !